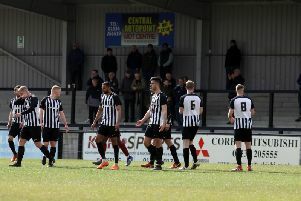 Jason Lee has admitted he had no idea his cheeky swig of a fan’s pint would lead to a big payday for Corby Town. The defender celebrated Ben Milnes’ winning goal against Mickleover Sports at Steel Park in February by having a quick slurp of the alcoholic beverage that was resting on a barrier. It was a moment captured by the eagle eye of Northamptonshire Telegraph photographer Alison Bagley and the picture quickly went viral before it was nominated as one of the celebrations of the season in Marathonbet’s #NonLeagueChallenge. After an online vote, Lee’s celebration was named the winner to bag the Steelmen £10,000 and a special pre-season friendly against a Premier League legends team at Steel Park on Sunday, July 30. Lee and chairman Stevie Noble were on hand at Steel Park last week to receive the club’s cheque from former England winger Chris Waddle who is the latest name to be added to the legends squad. The likes of Ray Parlour, Eidur Gudjohnsen, Emile Heskey and Chris Sutton have already been confirmed as members of the squad for July 30. And Lee, who received his prize at the National Game Awards at Chelsea’s Stamford Bridge stadium yesterday (Wednesday), can’t wait to test himself against some of the greats of the Premier League. “I had no idea that this would all happen,” the defender, who joined the Steelmen late last year, said. “I just came over for the celebration, we were getting soaked with the beer that was being spilt and I just helped myself to a little bit. “I didn’t think it would lead to all this but I am glad it has. To be here with a Premier League legend like Chris Waddle, it beats sticking plaster on a ceiling for a while! “The £10,000 is massive for any non-League club but with the legends game, the possibilities that could happen on that day are amazing. “The club could get 3,000 people in to watch it and we would love to have the local community here enjoying themselves, all because of one celebration.